More amazing blogger professionalism here as I noted that it was (almost) a year ago when I took this group of pictures at the – then empty – Theewaterskloof Dam near Villiersdorp. Here’s the post. Today, Theewaterskloof stands at 48% full, compared to 14% when we visited last year. Overall, our dams are 62% full, compared to 27% this time last year. There are no worries about not having water in a couple of months time. All is good. All is moist. Firstly, that there is a small, yet vocal, minority of individuals who still believe that the moon landings were faked. Secondly, supposing for just a moment that their allegations are correct (which they’re not); the sheer amount of effort to clandestinely remove billions and billions of litres of water over three years – enough to fool NASA (the same guys who faked the moon landings), prevent meaningful precipitation over a catchment area of 500 square kilometres (for Theewaterskloof alone) for 36 months and make news headlines worldwide surely deserves some sort of accolade? Admit it: that is an incredible endeavour. And for those thinking of switching their upcoming election vote away from the DA because of the way that they handled the crisis (and yes, it certainly wasn’t perfect), please make sure you choose to vote for a party which you genuinely believe could have managed it any better. There’s suddenly not such a great selection any more, hey? Here are a few takeaways from this week’s numbers and the information provided therein. We are still using too much water. And by “we”, I mean people who aren’t me or my family. But even so, even with those people who aren’t me and my family, Cape Town has cut its water use by almost 50% when compared with similar periods a few years back. Can “we” do better? Well, “we” should be able to, but interestingly, “we” have been stuck at this sort of level for a while now. Could this be some sort of impasse, and if so, why is it happening and what can the City do to get past it? There are already plenty of measures in place, but are they actually having enough effect? 582 million litres x 7 days = 4,060 million litres, but actual volume stored in the dams dropped by 8,739 million litres. That discrepancy is mainly due to evaporation because of the hot weather and strong winds we’ve seen this week over the Winelands area. So, in the last 7 days, we’ve lost an additional 8 days at 582 million litres back up to the sky. And let’s face it – it’s going to be hot and windy a lot more over the summer. The good news is that even with this continuing overuse and huge evaporation, the dam levels “only” dropped by 1%. Simple maths suggests that with 26% of usable water still available, and using/losing 1% a week, we can last another 26 weeks. I’ve been doing some (more) rudimentary calculations and I reckon that takes us to the middle of May. We might just make it. Or not. I actually have no idea. Because historically, water usage goes up at this time of year into summer. 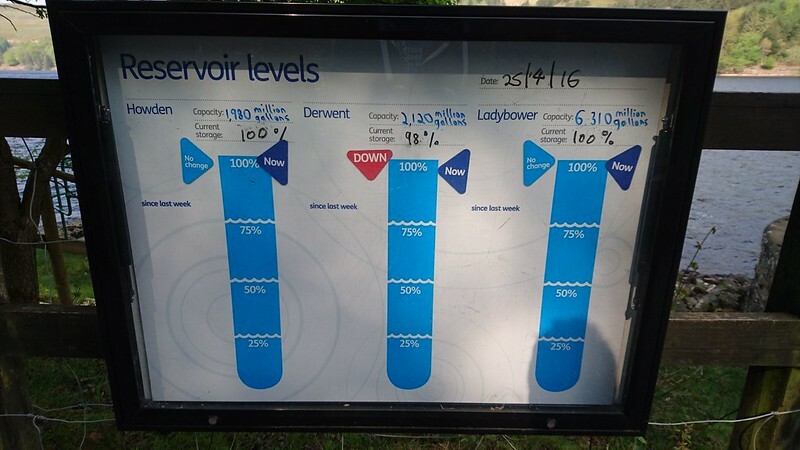 Taking 2014/15 as an example of unrestricted use, and comparing it with last summer (when restrictions were in force), we can see that there has been a reduction of maybe 400 million litres a day. And yes, production (blue line) is still above where we need it to be (pink line), but that graph tells a good story, and with more draconian measures in place this year, will hopefully continue to do so. Addition of temporary small scale desalination plants and tapping into local aquifers will mitigate supply issues a little too. It rained this morning, which ruined the kids’ sports day, but at least I got another 100 litres or so from my sausages. And I’m only concentrating on that latter fact, because we’re really not in any position to complain about any negative effects of precipitation in Cape Town right now. Chin up. We might just survive this yet. Keep saving. Every little helps. It’s nearly the end of July, and that means that it’ll soon be August. After that… [double checks] yes, September. So what? This happens every year, right? Well, yes it does, but September 1st is unofficially known as Spring Day in South Africa, bringing with it… well… Spring. Not really Spring, but unofficially Spring. Springy enough not to be Winter anymore. Unofficially, at least. 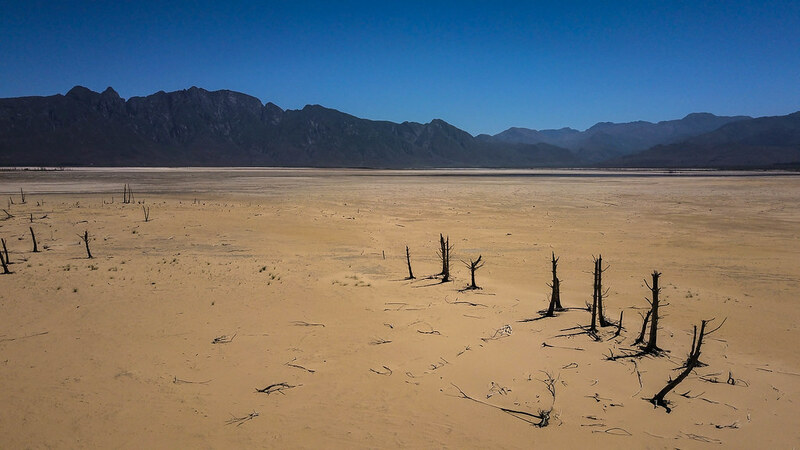 That also happens every year, but given that we’re basically 5 weeks away from it (and therefore 5 weeks away from what is unofficially the end of the rainy season), and our dams are still looking emptier than an ANC promise, we really should be well into full panic mode by now. 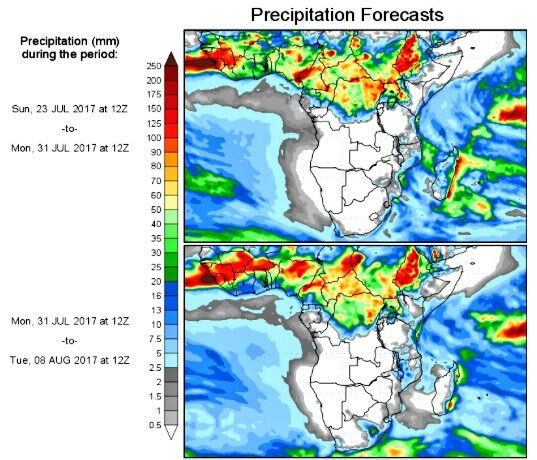 Especially given that the medium term forecast for the next fortnight (making up, as it does, 40% of that 5 week period) shows no sign of significant rainfall for the Western Cape. Look, tomorrow is not going to be dry, but with a forecast of just 5.2mm of precipitation over 24 hours, it’s not going to be particularly wet either. 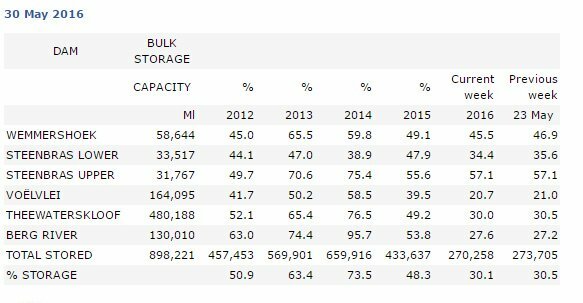 With the Cape Town dams sitting at 27.4% of capacity (as per this morning’s city figures) – and with the last 10% of that infamously “unusable” – things are looking every bit as precarious as ever. Add to that the fact that Cape Town’s residents are using 643,000,000 litres a day (that’s 143,000,000 litres or almost 30% more than we should be) and you (actually “we”) have a recipe for disaster. There’s enough publicity about this situation on the TV, the internet (not least this damned blog), the radio and everywhere else for everyone in Cape Town to understand the gravity of the situation. But given that we’re apparently still paying no attention and not saving nearly enough of the wet stuff, I’ve now come to the conclusion that a lot of the locals simply don’t care. I wonder how they’ll feel in 6 months time? As of 0600 this morning (it’s Friday today, for those wondering), the Theewaterskloof dam has 5,476,628,400,000 more litres of water in it than its low point on Tuesday at 1200. That only equates to its volume being 1.14% up on earlier in the week. And therein lies the message that there’s a long, LONG way to go yet till we’re out of this mess, folks. Keep saving water! * Obviously, there will still be inflows that haven’t reached the dam yet, so this figure will rise a bit.